At Autonetics, we design and build each gauge to the needs of our client. Many of our gauges use commercial off-the-shelf hardware, along with hardware produced in-house. With the variety of sensor systems available on the market, when and why would we decide to use custom hardware? For the past several years, Autonetics has been advancing our internally-developed micrometer technology. Although we use many types of commercial sensors, we benefit greatly from building our own. In testing, we can achieve sampling rates of up to 80,000 samples per second, with sub-micron resolution. When building a gauge, faster sampling and higher resolution gives us flexibility to achieve shorter cycle times, better repeatability, or tighter tolerances. Additionally, our experience building our own sensor hardware gives us better insight when evaluating commercial sensor systems. In the end, this allows us to build a better gauge than we would otherwise have built. At the core of virtually every Autonetics gauge, there is one or more custom printed circuit boards. These PCBs have been designed and tested in-house through several revisions, and we are continually finding ways to enhance their functionality. 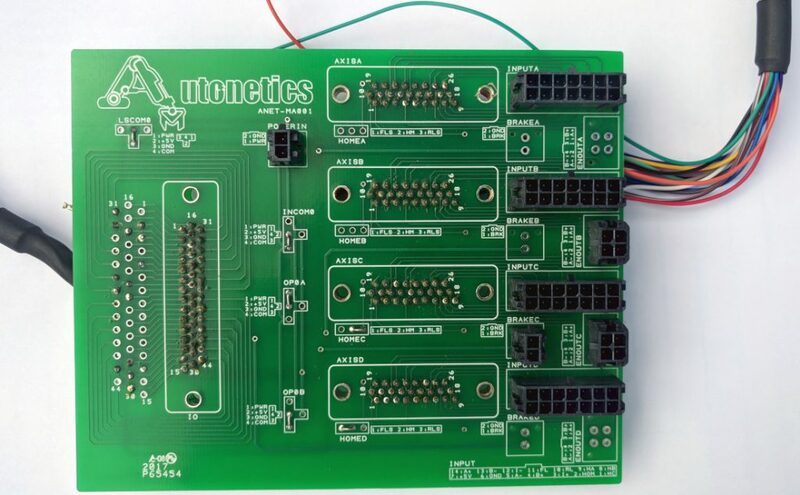 Our Data Gather Boards synchronize the data from multiple encoders, micrometers, and temperature sensors. These synchronized readings are then relayed over ethernet to our PC application. Our Pulser Boards actively trigger multiple sensors simultaneously, based on an encoder position or other interrupt signal. This again allows us to synchronize data from multiple sensors. These boards enable us to use a stock Windows OS, rather than an RTOS, thus reducing both expense and complexity. By synchronizing the data in hardware, we also reduce the CPU processing load on our PCs, leaving them free to perform more advanced calculations. Although these boards are flexible enough to be used across our entire line of gauges, they are very specific to the work that Autonetics does. Finding off-the-shelf data gather hardware that meets all of our needs would be impossible. Because Autonetics designs custom gauges, we are often faced with form-factor limitations. A gauge may need to fit into a small footprint on an existing factory floor. Measurement heads may need to be compact or oddly-shaped because of space or weight concerns. In one recent instance, we needed to connect multiple ethernet devices inside a measurement head. However, the measurement head already needed to fit several sensors and other devices in a certain configuration. The size and shape of the remaining space could not fit even a small 5-port ethernet switch. To accommodate this requirement, we designed a small PCB around an available 10Mbps ethernet package. By creating a minimal PCB, and removing the typical RJ-45 ethernet connectors, we were able to pack the devices and connectivity we needed into the space available. Each Autonetics gauge is designed and built using a combination of custom-built and off-the-shelf hardware. By intelligently selecting between the two, Autonetics is able to deliver custom gauging solutions that perform well and are better suited to the needs of our clients than any one-size-fits-all product.